If dry air is a problem in your household, a humidifier could be a simple solution to bring moisture back into your dry indoor environment. Humidifiers use a filtration system to release clean, moist air into your indoor spaces. 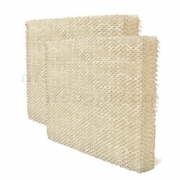 Aprilaire humidifier filters are a high-quality product made by a leading manufacturer that removes undesirable particles and provides a sought-after, comfortable living environment. The Aprilaire humidifier water panel (aka Aprilaire humidifier filter, water pad, evaporator pad) replaces the humidifier filter in many makes and models of whole house humidifiers. This product is found in the large bypass and fan-powered humidifiers contained in systems manufactured by Aprilaire. 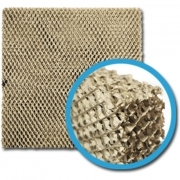 The humidifier filter is constructed from an expanded aluminum mesh pad. 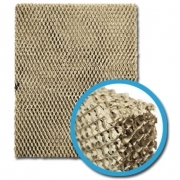 This aluminum mesh pad is coated with a clay-like covering that can absorb water and remove mineral deposits. The humidification process begins when water flows through a humidifier valve and soaks the Aprilaire humidifier filter. 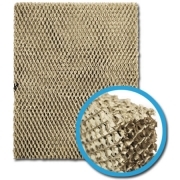 Hot, dry air from the furnace or fan coil then passes through the filter and absorbs the water. The moist air from the Aprilaire humidifier water panel then creates water vapor. This vapor is then carried through the air system and distributed through the home via the forced-air duct system. To ensure the maximum efficiency of your Aprilaire humidifier filters, it is recommended you replace your whole house humidifier filter at least once per heating season. The longer your filter is in use, more build-up will accumulate on the media. This can reduce the efficiency of the Aprilaire humidifier water panel and potentially cause problems for your system and your health. To mitigate this risk, routine panel changes should occur. Areas with hard water may require two changes per season to ensure peak performance.